Small and medium-sized companies (including those located in one room) may need to share emails to enhance their customer service, relations with suppliers or just to improve an email operating channel which is used by several people at once. It might seem that the only option in such case would be to maintain a server or upload data to the Cloud. However, CodeTwo found a solution how to share Outlook emails without Exchange or Cloud-based services. 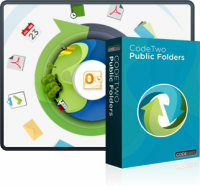 It is called CodeTwo Public Folders. This software allows you to create public inboxes in Outlook that are synchronized with other inboxes, without the need to disclose any credentials to others or manually forward messages. It’s a perfect solution when it comes e.g. to distributing customer service messages between employees. Install CodeTwo Public Folders in your network. Create a new public folder in the C2PublicFolders folder tree that will act as your common inbox. Open Outlook and from the top menu select Rules and then New Rule. From the Start a blank rule section choose Apply rule on message I received and click Next. 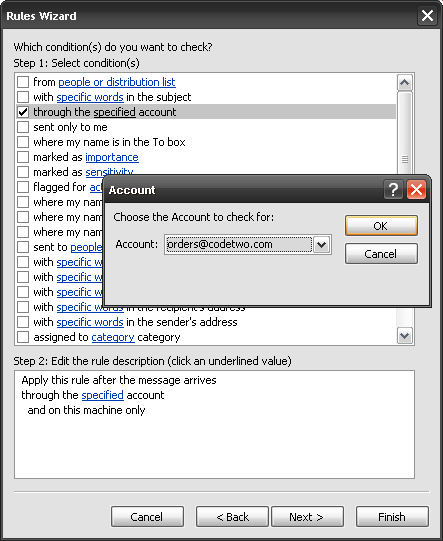 Check the Through the specified account option and choose an email account that will be used to receive messages. Click Next. Select the Move it to the specified folder option. Choose the public folder you created in Step 2 as the destination. Save it and click Next. You can now define exceptions for your rule, if needed. Click Next. Finally, the Summary box shows up where you can review your rule and specify its name. If you want to apply the same Outlook rule on many computers, you need to copy it to the rest of the PCs. 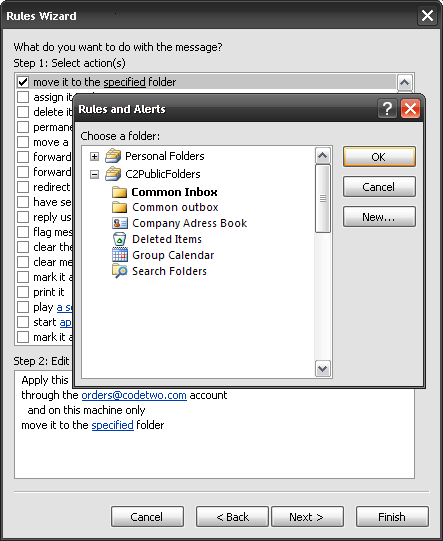 Now emails, that need to land in a common Outlook inbox, will be filtered and immediately placed in one of the dedicated public folders in the C2PublicFolders folder tree. For example, if your company uses general inboxes like info[@]yourcompany.com, office[@]yourcompany.com and you want to distribute incoming emails to different departments e.g. marketing, sales or HR, CodeTwo Public Folders is the right solution for you. Owing to the program, each email from such mailbox can automatically land in a public folder available to the whole department and processed by any team member, depending on their availability at a given moment. When a new email comes in, one of the employees can start to work with it directly in his or her Outlook. No need to manually forward messages or log in to additional email accounts. Apart from sharing emails, CodeTwo Public Folders also lets you share Outlook calendars, contacts, tasks and notes seamlessly. The synchronization process can take place in local network or across the Internet. Just chose the folder you want to share and with a few clicks you will make it available to a selected group of users in your office or company. With the use of the personal folder sharing option, managers can keep an eye on other employees inboxes or access any other Outlook folder from their email accounts when needed. You don’t have to run around the office with a USB stick to share files that are too big to be sent by email. Thanks to the File Sharing App featured in the CodeTwo Public Folders installer you can also securely share files outside Outlook between multiple computers, both in local network or across the Internet. All types of files are supported: documents, photos, videos and so forth. Furthermore, the solution is not Cloud-based. Data is kept on the linked machines only, which is crucial in terms of safety. You can share sensitive information with your team without worrying about security issues anymore. 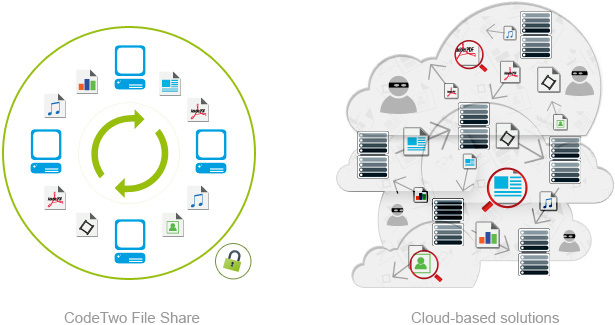 Learn more about how to share files with CodeTwo File Sharing App.